The Orville, the new series from Seth MacFarlane, promises more aspirational sci-fi, but delivers a bland version of Star Trek fan fiction instead. Seth MacFarlane's new sci-fi comedy The Orville is not a spoof on Star Trek (or at least not a very funny one). Rather it is an oddly earnest and sometimes overly serious homage to the classic sci-fi series that, despite coming from the guy who has provided plenty of voices over the course of his very successful career, never discovers (or seems to have much interest in discovering) its own. Instead, during the three episodes sent out to critics, The Orville exists within the confines of a familiar episodic structure and visual aesthetic borrowed from '90s Trek TV series, like The Next Generation or Voyager, while over exerting itself when trying to blend MacFarlane's familiar brand of crude, frat-boy humor into the mix. The result, then, is a weird pastiche of two entirely different kinds of television shows, the various elements of which remain immiscible – partly because of the show's languorous attempts to combine the two and, MacFarlane's obvious admiration for the original Trek notwithstanding, sometimes these elements just don't belong together. A combination of bawdy humor and Star Trek can work; Galaxy Quest proved as much by being a competent and funny spoof on the franchise (and its stars), while still making for a fairly thrilling Trek-like voyage. The nearly 20-year-old film went beyond mere parody or imitation, though. Moreover, when the tone shifted from outright comedy to sci-fi adventure the change was coherent. That's not the case here, as The Orville makes a sincere attempt at aspirational science fiction one minute, and then swerves wildly into a prolonged joke about alien bodily functions the next. The resulting discordant note is struck again and again throughout the premiere with the results remaining pretty much the same. Star Trek is such an touchstone within the vast cosmos of popular culture that you needn't be steeped in the particulars of its many movies and television series to see The Orville has difficulty presenting itself as anything more than fan fiction for an admitted enthusiast of the material. Here, that fan's commercial success affords him the luxury of doing whatever it is he wants – even if it's essentially expensive Star Trek cosplay. MacFarlane stars as Ed Mercer, a once-promising candidate for a starship captain who flamed out after coming home one day to find his wife Kelly (Adrienne Pallicki) in bed with an alien. That's the beginning and the end of the show trying to find anything interesting for Pallicki to do. Once Ed's captaincy of the Orville is secured, a development that suggests Kelly is interested in making amends with her ex and maybe even getting back together with him as one of the chief architects in his sudden career reversal, she is slotted into the story as Ed's second in command. It's a non-negotiable condition of his captaincy that also serves to facilitate the series' efforts to disrupt the familiar starship hierarchy by combining a typically staid workplace scenario with all the hilarity that naturally comes from a broken marriage. The result reduces Kelly to fodder for a series of mostly uneven jokes from both Scott Grimes' Gordon Malloy and J. Lee's John Lamar, while also having her deliver the overly earnest and out-of-left field ending to the premiere. The show bizarrely keeps coming back to the domestic drama between Ed and Kelly, despite the fact the requisite chemistry just isn't there. The two squabble less like a real couple and more like the sitcom equivalent of one, the value of which is questionable from the onset, but it raises a question of tone that The Orville never seems able to answer in its first three episodes. Beyond Kelly and Ed's spats, irresponsible-but-gifted pilot Gordon is typically relied upon to deliver jokes that simply never land. Perhaps it’s a byproduct of MacFarlane doubling down on his goal of delivering aspirational sci-fi, but the jokes here feel more like an afterthought, like they were worked into a dusty, unused Next Generation script instead of written to make The Orville actually funny. Because the rhythm of the show's humor is off everything else struggles to find the beat as well. The hopeful notes are from an entirely different (but at least somewhat palatable) show, but every time the series' purported sincerity comes to the foreground it's either undercut by a poorly timed joke or it's so baldly earnest that it may as well be one. The two sides of the show work at cross purposes enough that it would be in the best interest of The Orville to either drop the bad jokes altogether or cut it down from a one-hour drama into a half-hour spoof like the marketing made it out to be. But without the jokes or MacFarlane's attempts at finding humor in the bodily functions of a race of aliens with only one gender, the show doesn't have an identity beyond being a pale imitation of Star Trek – or, to put it more kindly, a lesser spinoff of the Star Trek brand. There's no reason for the show to have been made outside of its creator's obvious fondness for the material that he's drawing from. The show might have stood a better chance with a different actor in the captain's chair, one better suited to navigating the inexplicable tonal shifts and maybe earn the audience's patience and empathy in the process. On screen MacFarlane's swings at authenticity just register insincere, partly because the material he's been responsible for over the years has trained he audience to think there's a joke, non-sequitur, or gratuitous musical number lurking behind every line of dialogue, and partly because it only takes a few minutes before this passion project feels more like simple ego stroking. As such, outside of its creator, it's hard to know what audience this show is for. It seems unlikely Trek fans will fall over themselves for it, especially with Star Trek: Discovery premiering later this month on CBS All Access. Moreover, because the show doesn't serve up the usual MacFarlane brand humor, Family Guy, American Dad, and Ted (or even Ted 2) fans may find themselves scratching their heads and looking elsewhere for some fratty yucks. As such The Orville will likely find itself drifting alone in space until it can figure what kind of show it is supposed to be. 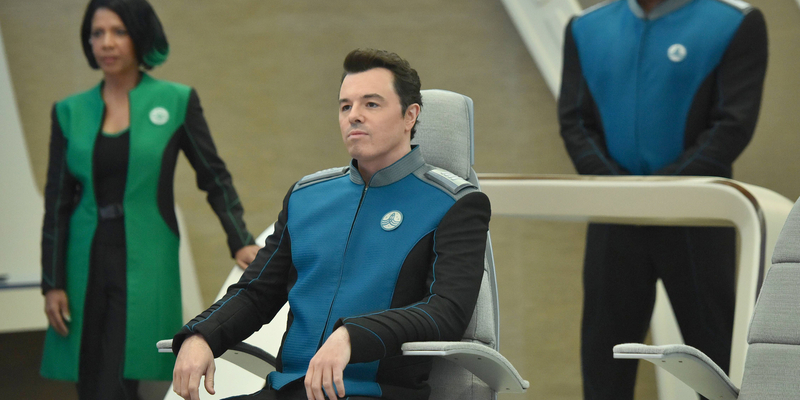 The Orville continues Monday night with 'Command and Performance' @8pm on FOX.